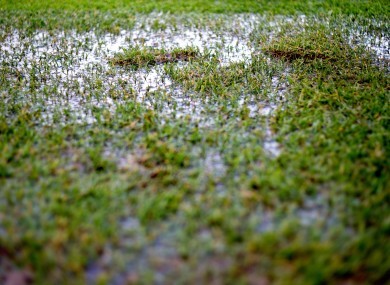 THE LATEST DELUGE of rain has forced the postponement of two of Sunday’s Munster GAA fixtures due to unplayable pitches. The Munster senior hurling league game between Waterford and Limerick in Carriganore and the meeting of Waterford and Cork in the McGrath Cup in An Rinn have both fallen foul of the weather. The Déise’s round two clash with TJ Ryan’s Limerick has been rescheduled for Tuesday 19 January in Carriganore with a start time of 7.30pm. The McGrath Cup fixture has yet to be refixed. Email “Two of Sunday's Munster GAA games have already fallen foul of the weather ”. Feedback on “Two of Sunday's Munster GAA games have already fallen foul of the weather ”.